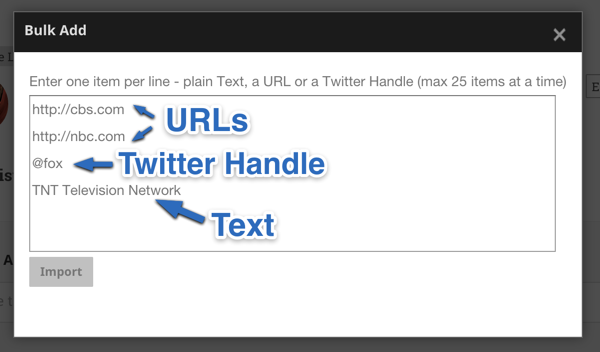 You can quickly add a bunch of URLs or text items to a list via a “Note” like UI. Listly will process each line into items that you can save to the list. Each item can be a simple text, an URL (we will grab metadata for you), or a Twitter Handle (we will grab the Twitter user metadata for you). When you click on import, Listly will populate all the items for your review before you choose to save. Remember that these items are not yet saved! You can now edit the items, change images before you save them to your list.